Hi Fans, so I'm back from my honeymoon & can't wait to gush about all the wonderful new recipes I've come across. First I have to fill you in on the cutest happy accident I came across- Crescent Wrapped Hot Dogs! My mom ran out of hot dog buns, had crescent rolls on hand & voila, a star is born!. Memorial Day Weekend's coming up & I think your guests will love these succulent puppies. 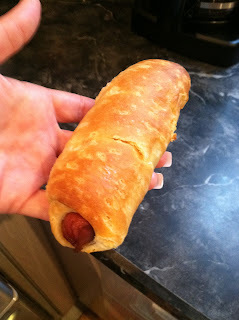 Save the hot dog buns for lobster rolls (yum) & instead wrap your franks in crescent rolls- think full size pigs in blanket! Top with w/ carmelized onions, cheese or even bacon then wrap in blanket & bake a few minutes until golden- this one's sure to be a hit!